lunch "re-union" in Kulai last Saturday. I believe that people of the same age group can recognize each other much better, than the younger age group, as they grow and change so much !!! ( not an excuse for poor memory! wish I could add a few gigs to my hard disk! ). Greetings to all those reading in copy of this email. Thank you for the many years you spent with us when we were young. One vivid memory was your presence during our regular camping in the English Primary School. 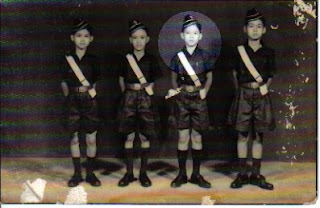 When I was a young boy, we had officers come by to be with us as role models. These officers encouraged us greatly by giving us your time and being there when we needed you most. One of the officers was you, Mr. Kam. You will not know how important it was during those time that we had you come by for us. You made all the difference. 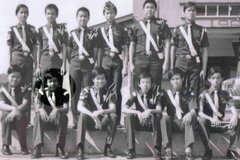 Remember during one outing, many BB boys (Kok Wah and Poh Lim's batch) were lost while trekking in Gunung Pulai? We got news that you were ever ready to extend help to us although we found our way out. We were informed later that you tried to arrange a land rover to go into Gunung Pulai to search for us. Now that I am an adult, I try to follow in your footsteps helping the youth as much as I can. Mr. Kam, Thank you for being for us when we needed you. Thank you so much for your email, I feel proud to hear that all of you are doing well. laugh when it was suggested that if we can travel faster than the speed of light, go to one of those faraway planets and return younger than our children !! I am sure when they grow up, they would surely appreciate your presence and guidance, although they may feel otherwise now ! I understand that you are very active in the BB, B Pahat. Keep up the good work and keep in touch. glad to note that you're still doing well. I wondered you can still remember me bur during your time as an official in 1st Kulai, I always look up on you as my role model. Then and then, I used to ask about you. They told me that you're doing well with UMW. I still remember you've a house in 21st mile.You still using your Fiat 127 in yellow color. Thank you for forwarding Let long's message to me. I am now in Algiers, Algeria and rather busy so have not visited the alumni site lately. you guys and was really pleased to hear that all of you are doing well. in your strike and built up the Company. any more Fiats! And you are right again about my Fiat 127.Good memory. Hopefully we can meet up with you and the others as well in the near future.